Interchemie is a Veterinary Manufacturer based in The Netherlands. Interchemie has 3 production lines, namely: an injectables line, an oral liquids line and a watersoluble powders line. To produce medicines, all our production lines have to meet the latest GMP and GMP+ guidelines. The production process begins with the collection of the right raw materials. When new raw materials arrive, they are first placed in quarantine until they are analysed and cleared for release. This is always carried out by a qualified person. Then the raw materials are mixed in a mixer. When the mixture is ready, it is filled into jars, sachets or bottles. Interchemie has lines for injectables, oral liquids and water-soluble powders in order to meet customers' demands for different dosage forms. After a product has been filled, the jars and bottles are labelled. Interchemie uses a number of different labels per product. The choice of label depends on the country to which the product will be sent and the language spoken there. Before the products are shipped to customers, they are analysed once again. After release by our laboratory, the products can be shipped to our customers. All our products are stored in our warehouse while they await shipping. Products are packaged securely so that they can be shipped by sea or air. Our logistics department coordinates closely with distributors abroad to ensure that each delivery arrives safely at its destination. Quality is a very high priority at Interchemie; we only want to offer our customers the best. That is why we at Interchemie operate under strict GMP and GMP+ guidelines. By operating according to GMP guidelines, we can guarantee the quality and safety of all our products. Factory operations are carried out according to strict health and safety requirements, and regular analyses and controls are performed to safeguard the quality of raw materials and finished products. This means that the end user is always assured of high-quality products. Our factory is regularly inspected by the Dutch Health Care Inspectorate (IGZ). Our QA department monitors the quality of our raw materials, finished products and production processes. Internal and external checks are always conducted by a qualified person; this means that we do not only check our own factory, we also regularly inspect our suppliers. 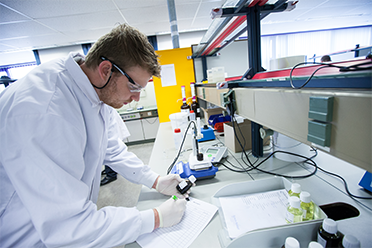 Interchemie has its own laboratory, where raw materials and finished products are analysed. Before raw materials can be used in the production process, they must first be quarantined. Raw materials may only be released after they have been analysed and approved. The same method is used in the analysis of the final product; it can only be shipped after being first analysed then released. This means that Interchemie can guarantee the quality and reliability of every product.